Valentine’s Day is just around the corner. 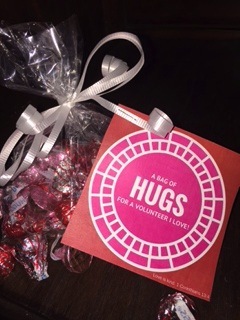 It’s a great day to show love for your spouse and kids, but it’s also a great day to show your volunteers some love. This year, it’s especially convenient because Valentine’s Day is actually on a Sunday. Go ahead and mark your calendar to do something special for your volunteers this Valentine’s Day. I recommend that you deliver these gifts to your volunteers personally when possible instead of just leaving them in their assigned areas. If you are struggling with an idea for Teacher Appreciation, here’s one! Fill cellophane bags with about 10 Hershey’s Hugs. Tie curling ribbon around the top of each bag. Attach labels to the curling ribbon with a stapler. OPTIONAL: Consider writing a personal note of thanks on the back of each label. Jeff Land loves life! That’s pretty great, because his job here at LifeWay is the Team Leader for Bible Studies for Life: Kids. Jeff loves his life which is so blessed by his amazing wife, Abbey, and their four sons, Reed, Nash, Will, and Tuck. A natural encourager and fun-lover, look for Jeff’s posts about teacher appreciation and game ideas. When not serving at work, Jeff serves 2nd graders at his church, First Baptist Church Joelton, Tennessee. Having enough glue is important. Planning a great activity makes a small group’s time pop! You WANT parents to ask their kids, “Did you have fun in church?” You want the answer to be “Yes!” But at the end of their lives…at the end of their time with you, their KidMin leader, what are the REALLY important things that kids need to hear. Since 2003 Bill Emeott has served as a Kids Ministry Specialist for LifeWay. His passions include childhood ministry leadership training and development, leading children’s Bible Study, and being an uncle! Bill has been teaching children at First Baptist Nashville for ten years. Fall Appreciation: Thanks for “TEA”ching! Water’d We Do Without You? Print one label for each leader. Buy one bottle of water per leader. Trim all of the printed labels. Remove the original labels from each water bottle. Wrap the trimmed labels around each bottle and secure with clear tape. Personally, I prefer a cold bottle of water to room temperature, so I put mine in the fridge overnight (but don’t let them get too cold because they will sweat through the paper if you do!). Buy one bottle of tea per leader (I used Snapple.). Trim all of the printed labels. Remove the original labels from each tea bottle. Wrap the trimmed labels around each bottle and secure with clear tape. Jeff Land loves life! That’s pretty great, because his job here at LifeWay is the Team Leader for Bible Studies for Life: Kids. Jeff loves his life which is so blessed by his amazing wife, Abbey, and their four sons, Reed, Nash, Will, and Tuck. A natural encourager and fun-lover, look for Jeff’s posts about teacher appreciation and game ideas. When not serving at work, Jeff serves 2nd graders at his church, First Baptist Church, Joelton, TN. Take the time to lay out a foundation for the intern before they arrive. Once your intern arrives, set clear expectations and plan meetings with them every few weeks to discuss their performance. Interns like to feel like they are being helpful, so give them tasks that they can flourish at on their own. It’s essential to give ownership over projects in order to challenge and provide opportunities to grow in confidence. It is important for your intern to hear what they are doing right. Encourage them and make sure they know they have potential that the church wants to use for God’s glory and kingdom advancement. Ask how they are doing and build a personal relationship with your intern. Talk to them about prayer needs and create a relationship in which they are comfortable. This will open doors for easier communication should a conflict arise during the course of the internship. At the end of the day, your interns can greatly impact the kids in your ministry, free up your busy schedule, and gain experience in the field of ministry. I hope you’ll prayerfully consider adding an intern to your team when the season is right. Lana Sydenstricker serves as a LifeWay Kids Social Media and Marketing intern. A native Ohioan, she moved to Nashville in 2013 to pursue a degree in PR from Lipscomb University, where she participates in athletics and missions. I’m so blessed that my wife is not only my best friend, she’s also my partner in ministry. She understands kids ministry, and like me, she also does a good bit of traveling to other churches doing trainings and consultations. She recently went to a church to consult with them about some issues they were having with their Sunday morning Bible study curriculum. The children’s minister called her in advance and told her that the volunteers were largely pleased with the curriculum, but one volunteer was so unpleased with the curriculum that her displeasure was causing the whole volunteer base to get upset. In his book, The Purpose Driven Life, Rick Warren describes certain personalities as EGR or “extra grace required”. My wife and I have used this term a lot to describe people that we know. In the case of the church above, I think that the volunteer would definitely be an EGR or maybe even an EEGR. Teach them. It could be that your volunteer is struggling because he has no idea what he is doing. I’ve heard people say, “Well, he has a college degree. He should be able to teach kids!” So untrue. Instead of just assuming that everyone knows how to read a leader guide, make sure that you are providing adequate training for your volunteers. This can include online trainings like Ministry Grid, regional training events, worker meetings, and apprenticeships. Lead by example. Is it possible that your own attitude is spilling over into the attitudes of your volunteers? When someone complains about an activity or event, do you jump on the bandwagon or do you try to give it a positive spin? I’m sure you know which of the aforementioned choices will have the more desirable outcome. Try matching the volunteer with a super positive volunteer. I think about my son Nash’s current Sunday school teacher, Mrs. Carol. She is always so positive. If our ministry area had a teacher needing a little positive outlook on life, Mrs. Carol would be a great partner teacher. Pray. The Bible tells us to pray constantly. And we should definitely pray for our volunteers. Pray that your volunteer’s attitude will change. Prayerfully consider approaching the volunteer and ask how you can help her have a more positive experience. Finally, and probably most unconventionally, you may need to pray for a “blessed subtraction” (maybe asking God to show the volunteer a place in your church where he may be more suited for ministry). How do you make a difference in the world around you? How do you stand for your convictions in the midst of moral turmoil? More than that, how do you influence a generation to grow up as culture shapers rather than simply conforming to the world? These are some of the questions we will explore at LifeWay’s Kids Ministry Conference (KMC) this October 19-21. “You are the salt of the earth. But if the salt should lose its taste, how can it be made salty? It’s no longer good for anything but to be thrown out and trampled on by men. 14 “You are the light of the world. A city situated on a hill cannot be hidden. 15 No one lights a lamp and puts it under a basket, but rather on a lampstand, and it gives light for all who are in the house. 16 In the same way, let your light shine before men, so that they may see your good works and give glory to your Father in heaven. In this passage, Jesus shares with His disciples the importance of influencing the world around them. One emphasis in these verses is on maintaining saltiness. Jesus says that if salt loses its taste, it is good for nothing more than being “thrown out and trampled on.” We cannot simply blend in with the rest of the world. In order to shape the culture, first and foremost we must ask the Holy Spirit to empower us to live holy lives. In addition, Matthew 5 tells us that we should “let our light shine before men.” The idea here is that as we strive for holiness and live for Christ, people will see our good works and recognize Jesus living through us. We must allow His light to shine through us and radiate out into the world. He is the only true light and also our only hope for making a spiritual difference in the world. We hope you’ll join us at KMC this October 19-21 at Nashville’s Music City Center! Together we will further explore this idea of making a difference, shaping the culture, and radiating the light of Christ. Visit kidsministryconference.com for more details about the conference such as a list of speakers, a complete schedule, hotel information, and even media from previous conferences. This Fall, don’t simply shine your light in a dark world—RADIATE! I come from a very talented family of crafters and artists. Unfortunately, I didn’t get a lot of the talent, but I did get the desire to make things with my hands. We even have a secret facebook group where someone in our family challenges us to make something. 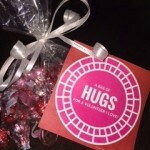 This month, I took that challenge and turned it into a teacher appreciation idea for Valentines Day. Start with a sheet of red copy paper. Trim the paper to make a square. Fold the square in half to form a triangle. Crease well. Fold the triangle in half again to make a smaller triangle. Crease well. Fold the triangle in half one last time to make a smaller triangle. Crease well. Unfold the paper to the original triangle made in step 2. Place the triangle on a table with the longest side facing you. Take the left corner and fold it up to the top corner. Do the same with the right corner forming a diamond shape. Tape the seams together with a small piece of clear tape. Flip the paper over to the untaped side. Fold the top point of the diamond down a little above the two outside corners. Flip the paper over to the taped side. Take the left point and fold down to make a small triangle point. Do the same with the right side. Flip over. You should have a heart shaped pocket. You can dog-ear the corners back a little to give it more of a heart shape, but I don’t think that is necessary. Also, since I’m not a purist, I used small pieces of tape to hold down any paper that wanted to flap up. Inside you can place a giftcard and write a catchy saying on the outside. I used a Starbucks® giftcard and a Chick-fil-a® giftcard for my samples. Chick-fil-a: Thanks for being a part of our herd. Burger King: Thanks for doing it God’s Way! If budget is an issue, you can stuff the pocket with candies. M&Ms: Thanks for melting hearts for Jesus! Party-favor size Play-Doh: You help mold hearts for God. Do you consider yourself a thought leader? If you oversee a ministry, you are perceived as a thought-leader (like it or not). A thought leader is an individual that is recognized as an authority in a specialized field and whose expertise is sought after. KidMin leader – that’s you! You are casting vision for your volunteers, families, and leaders. You are choosing or creating content that will best teach God’s word, and you are shepherding the hearts of children. You are a thought leader. So, when the busyness of doing ministry covers you up with meetings, phone calls, scheduling, shopping for crackers, background checks, and making endless copies, when do you have time to actually do the thinking, praying, and seeking that it takes to be a thought leader in ministry? The reality is, if you don’t make time for it, your chances for burnout are really high. If you are not doing what you originally felt called to do in your position, you are probably feeling tapped out. Therefore, be intentional about carving out time to think, read, journal, ideate, pray, and eventually lead. This is different than taking time to Sabbath and rest. Thought leadership should be part of your work-week rhythm and regiment. Block your calendar for at least two hours a week to devote time to this practice. Include reading leadership books, setting goals, meeting with other colleagues and professionals in your field, and documenting your thoughts on paper. Allowing time to truly think will enable you to be the thought leader your ministry needs you to be. At LifeWay, we strive to root everything in Scripture. Need reminders of God’s truth throughout your day? Click on the images below to begin downloading your new Facebook cover image and iPhone wallpaper. Happy Friday! Download Facebook cover photo here. To a child a divorce is the death of a marriage — their parent’s marriage. In most divorcing situations it is the death of the only family life they have ever known. It is a tremendous interruption to their lives. Many children are left standing in the middle wondering where they belong and questioning which direction and whom to follow. It can be hard for children to find comfort when they live in limbo, so to speak, between two families and perhaps even two churches. Are those of us in the church underrating what divorce does to a child? Research shows that divorce is the second highest rated stress event in a child’s life with death being number one. It takes a child of divorce on average about ten years to completely process the divorce. Many parents don’t wait ten years to remarry so the child is thrown into another marriage, or possibly two other marriages if both parents remarry. What Does Divorce Do to a Child’s Relationship with God? Divorce can destroy a child’s relationship with the church and with God. Many adult children of divorce do not attend church as adults. Some will tell you that the rejection from the church hurts almost as the divorce itself. Society has now reared an entire generation of kids whose parents divorced. We have pretty much lost many of those adults to church. Don’t you think it’s about time we stepped up and reached out to the child of divorce? It is time to talk about divorce in front of them. Ask them questions about the time with dad or with mom. Accept they will only be at your church every other weekend. It is now their schedule so work with them on special projects. Love them and be patient with them as they search for truthful answers to their questions about their parent’s love, devotion and God’s presence in their lives. Linda Ranson Jacobs has been a children’s ministry director, developed DC4K (DivorceCare for Kids), operated a therapeutic child care, and has extensive experience at successfully accommodating challenging behaviors. She is a leading expert on children of divorce. Linda is featured as an expert on the DivorceCare and the Single & Parenting dvd video series.